The conjugation of fluorophores, tracers and drug molecules to proteins and in particular antibodies enables the development of novel tools for diagnostic and therapeutic applications. Early methods made use of random conjugation chemistry to attach functional groups. This results in heterogeneous mixtures of protein conjugates and influences biochemical properties leading to altered or loss of activity. Our research focuses on the development of site-specific protein functionalization methods for the generation of uniform conjugates with defined activities. In particular, we are interested in the generation of highly defined and homogeneous antibody drug conjugates (ADCs). 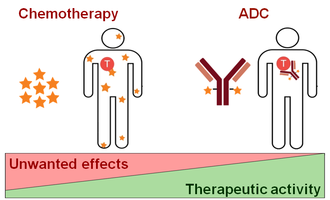 ADCs hold great promise for the selective drug targeting as they reduce side-effects of classical cancer therapy. In ADCs chemotherapeutic drugs are coupled to a cancer sensing monoclonal antibody (mAb) and thus guided to tumor cells. Upon cellular uptake of ADCs the attached drugs are released and specifically kill the tumor cells (Figure 1). Figure 1. The principle of Antibody Drug Conjugates (ADCs). ADCs combine the cancer killing properties of chemotherapeutic drugs with the targeted characteristics of therapeutic monoclonal antibodies. The drug is firmly linked to a cancer sensing antibody facilitating targeted delivery of the toxic compound to the cancer cell thus increasing therapeutic activity. The project emerged from an academic collaboration on site-selective protein functionalization between the groups of Professor Heinrich Leonhardt (LMU Munich) and Professor Christian Hackenberger (FMP Berlin). Within this collaboration, we developed the Tub-tag® technology as a novel chemoenzymatic labeling method. Here, we repurposed the tubulin associated enzyme Tubulin Tyrosine Ligase (TTL) for the attachment of functional moieties at the C-terminus of any protein of interest (POI). The TTL catalyzes the ligation of unnatural tyrosine derivatives to a target protein which subsequently serve as bioorthogonal handles for the site-specific coupling of toxins or other functional groups (Figure 2). Figure 2. Schematic depiction of Tub-tag labeling. (a) A tyrosine derivative carrying a unique chemical entity is ligated by the TTL to the Protein of Interest (POI). A subsequent bioorthogonal reaction is used for the site-specific attachment of a payload of interest. (b) The payload of interest is attached to the POI via a TTL catalyzed one-step ligation. Since April 2017, the group is funded by the EXIST Forschungstransfer I (www.exist.de) and co-led by Dr. Jonas Helma-Smets and Dr. Dominik Schumacher. The goal within the EXIST project is to validate the use of Tub-tag® for the generation of improved ADCs. Figure 3. The research group Tubulis is funded by the EXIST Forschungstransfer I.